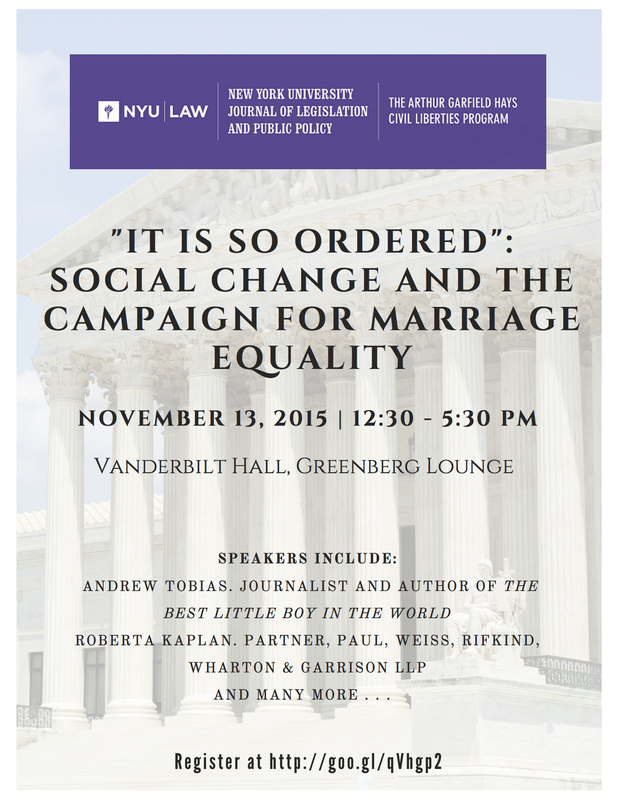 The Journal of Legislation and Public Policy and the Arthur Garfield Hays Civil Liberties Program partnered to host a Symposium entitled “‘It Is So Ordered’: Social Change and the Campaign for Marriage Equality” at New York University School of Law on Friday, November 13th, 2015. This event analyzed the implications of the U.S. Supreme Court’s historic decision in Obergefell v. Hodges for the lesbian, gay, bisexual, transgender, queer, intersex and asexual (“LGBTQIA”) community, specifically focusing on the numerous issues beyond marriage access that continue to pose challenges in the community’s struggle for equal rights. The Symposium engaged in further in-depth analysis of the movement for LGBTQIA equality by evaluating the legal strategies that this and other civil rights campaigns have employed in their efforts to achieve social change. The keynote address was delivered by Andrew Tobias, Journalist and Author of The Best Little Boy in the World. Panel 1 explored issues that continue to pose challenges for the lesbian, gay, bisexual, transgender, queer, intersex, and asexual (“LGBTQIA”) community in the wake of the Supreme Court’s decision in Obergefell v. Hodges, and that are now at the forefront of the movement for LGBTQIA rights. Panelists included Steven R. Shapiro, from the ACLU, Eliza Byard, from the Gay, Lesbian & Straight Education Network, Melissa Murray, from UC Berkeley School of Law, and Kevin Cathcart, from Lambda Legal. Panel 2 contextualized the LGBTQIA movement as one of a number of attempts to use courts, legislatures, organizing, and other means of advocacy to achieve social change. The panel facilitated a conversation among experts on different social-change movements—including those for racial, gender, and economic equality— to examine how these other efforts have proceeded after the Supreme Court recognized or rejected broad constitutional principles. Panelists included Burt Neuborne, Norman Dorsen Professor of Civil Liberties at NYU School of Law, Richard Blum, from the Legal Aid Society, Peggy Cooper Davis, John S. R. Shad Professor of Lawyering and Ethics at NYU School of Law, and Bebe Anderson, from the Center for Reproductive Rights. Roberta Kaplan, partner at Paul, Weiss, Rifkind, Wharton & Garrison LLP, delivered the closing remarks.